I need your help, friends. I have been asked to present at the upcoming International Neonatal Consortium meeting at month’s end. I am going to be talking about how researchers can best approach families at such a difficult time in the labor and delivery room to discuss a clinical research trial. Not an easy topic as you can imagine. I have decided to bring you with me, your voice in the form of survey responses. You can find the survey here. It has been 13+ years since I had my daughter, Becky. Yet, at times, it still feels like minutes ago. Oh what I would have given to travel back in time to that labor and delivery room as I found myself confronted by a OB Nurse with the ominous news, “You will be delivering tonight.” It was 11:40 p.m. and my daughter was born within 10 minutes after that fact. I was so caught off guard, so unprepared for what lay ahead. I wanted to stop time, to stop that delivery from happening. In the middle of all of that chaos, I can imagine a clinical researcher coming into the room well beforehand and say, “I have a drug in clinical trial that might help stop your labor thereby helping your daughter go full-term. Are you interested in participating in this trial?” What would I have done, I wonder? There are so many reasons why someone would or would not want to participate in a clinical trial it is hard to come up with a single answer of yes or no. Yet is due to these unsung heroes, families who risked a lot and said “Yes” that we have the preterm labor medications and protocols that we do in this day and age. They have undeniably saved lives. While it is too late for me to say yes to a clinical trial, I can still save lives and so can you. By arming clinical researchers with the best ways to approach families with a clinical trial request we can provide families with a sense of comfort in making their decision one way or another. Doing so could prevent future families from enduring the worst nightmare possible: the early birth and potential death of their longed-for baby. 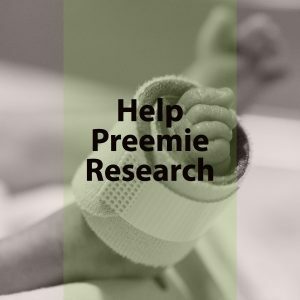 It could prevent them from enduring the ever present rollercoaster of emotions in the Neonatal Intensive Care Unit (NICU) as they watch their preemie struggle. Won’t you join me in a few minutes of thought-provoking questions? Thank you – please find the survey here.